Excerpt: Chapter 1. In Moonfleet Village So Deeps the pride of former days More The village of Moonfleet lies half a mile from the sea on the right or west bank of the Fleet stream. This rivulet, which is so narrow as it passes the houses that I have known a good jumper clear it without a pole, broadens out into salt marshes below the village, and loses itself at last in a lake of brackish water. The lake is good for nothing except sea?fowl, herons, and oysters, and forms such a place as they call in the Indies a lagoon; being shut off from the open Channel by a monstrous great beach or dike of pebbles, of which I shall speak more hereafter. 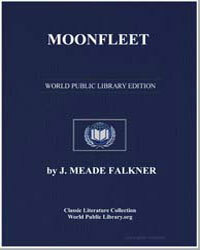 When I was a child I thought that this place was called Moonfleet, because on a still night, whether in summer, or an winter frosts, the moon shone very brightly on the lagoon; but learned afterwards that ?twas but short for ?Mohune?fleet, from the Mohunes, a great family who were once lords of all these parts.